The idea of in-situ visualization for surgical procedures has been widely discussed in the community [1,2,3,4]. 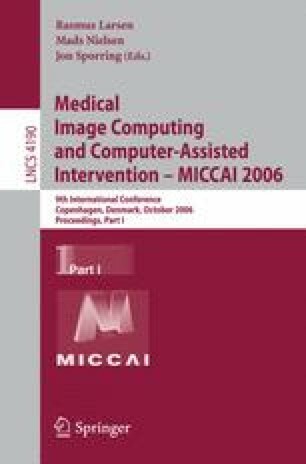 While the tracking technology offers nowadays a sufficient accuracy and visualization devices have been developed that fit seamlessly into the operational workflow [1,3], one crucial problem remains, which has been discussed already in the first paper on medical augmented reality . Even though the data is presented at the correct place, the physician often perceives the spatial position of the visualization to be closer or further because of virtual/real overlay. This paper describes and evaluates novel visualization techniques that are designed to overcome misleading depth perception of trivially superimposed virtual images on the real view. We have invited 20 surgeons to evaluate seven different visualization techniques using a head mounted display (HMD). The evaluation has been divided into two parts. In the first part, the depth perception of each kind of visualization is evaluated quantitatively. In the second part, the visualizations are evaluated qualitatively in regard to user friendliness and intuitiveness. This evaluation with a relevant number of surgeons using a state-of-the-art system is meant to guide future research and development on medical augmented reality.